Experience Woodstock like never before with the much anticipated memoirs of Woodstock co-creator Artie Kornfeld. This book is a look into the greatest music festival of all time as well as the notorious rock culture of the 1960’s. Artie’s new memoirs, The Pied Piper of Woodstock, is available at the Woodstock Story Book Store. One of the most anticipated book releases in the music industry, “The Pied Piper of Woodstock“, the memoirs of Woodstock 1969 co-creator Artie Kornfeld, will be available October 9th on Woodstock Story and Amazon.com. The book is a no holds barred, real deal account of the before-during-and-after of Woodstock told by the heavily influential music icon. In addition to outlining Kornfeld’s life growing up in the culture of American music, it covers his early career as a performer and songwriter, to his breakthrough as a producer promotion director, label owner, and arranger of some of the biggest names in music. Artie Kornfeld promises an interesting and accurate, tell-all depiction of growing up in the culture of American music and putting on the granddaddy of all music festivals. At a very young age, Kornfeld found himself swept up in the musci revolution of the 1960’s. He co-wrote the song “Pied Piper”, which became a U.S. number one hit, soon found himself in the studio with Dion and the Belmonts and, after becoming the youngest-ever VP at a major record label in his early 20’s, Kornfeld became a major driving force behind making the Woodstock festival a reality. Artie’s dedication was solely responsible for Warner Brothers making the event into an academy award winning documentary, solidifying Woodstock’s place in American history. As far as the 1969 festival is concerned, Kornfeld had the bands and connections to make it happen. The first vice president of rock and roll had been involved in the most chart topping songs and events of the time with a passion to get the message out. Kornfeld also convinced Fred Weintraub, VP of Warner Brothers to sign a hand written Woodstock movie deal only one day before the festival. He is featured in the documentary so often due to the fact that he had to convince the musicians to appear in the Warner’s film. 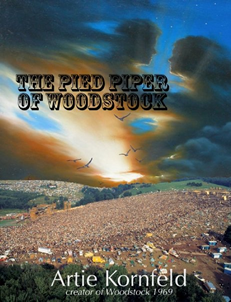 “The Pied Piper” is a brand new account of Woodstock 1969 as Artie and Linda Kornfeld experienced it. This book also delves into the Kornfeld family history. Shirley Kornfeld had been involved in the Civil Rights movement and is the creator of the freedom rides and telethons for the Congress of Racial Equality. Contained within his memoirs is a letter from the president of C.O.R.E. stating that without his mother’s participation, integration of American schools would have been pushed back 30 years. Artie Kornfeld made his living producing some of the biggest names in music history as well as spurring the alternative rock progression. He is accredited with over 100 gold and platinum awards, not to mention a total of 12 BMI awards. “The Pied Piper” is the official memoir of musician, record producer, music executive, and the Father of Woodstock, Artie Kornfeld.